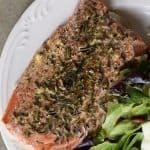 Lemon Dill Salmon has to be one of my very favorite meals. The flavors are simply perfect and delicious! And this salmon really couldn’t be easier to prepare. Which makes it wonderful to prepare for guests or for a busy, but special weeknight meal. I threw this salmon together in no-time flat. 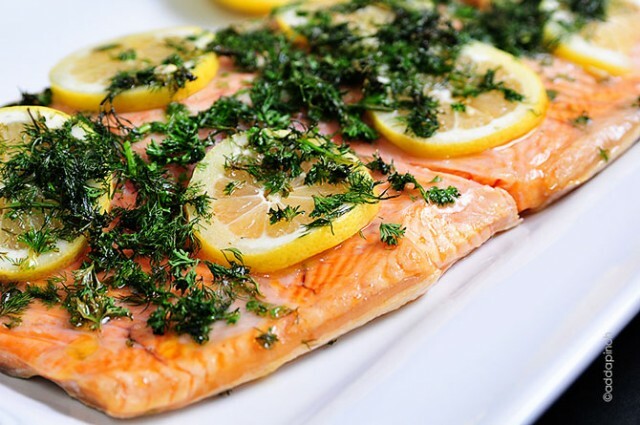 Simply place lemon slices on top of your salmon filet, then top with a mix of chopped dill and parsley. Then, I drizzled the entire filet with olive oil and seasoned with a bit of salt and pepper. Normally, my husband enjoys smoking the salmon on our Big Green Egg, but since he was busy I decided to take care of it in the oven instead. I recommend always using a meat thermometer to check the internal temperature of meats when you cook them, regardless of whether you’ve cooked them on the grill, stove, or in the oven. You can just never be too careful in my book. 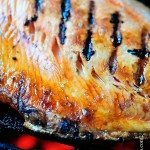 The internal temperature of salmon should register 140 degrees when fully-cooked. I like to remove it from the heat source about 10 degrees before this temperature (at 130 degrees), cover it, and allow it to continue cooking as it rests. This prevents the salmon from overcooking and becoming dry. It is certainly one of my favorite fail-proof tricks! 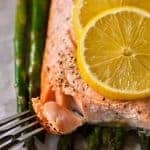 Here’s the recipe for my Lemon Dill Salmon. I hope you love it as much as we do. 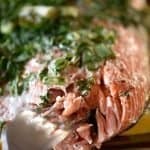 Lemon Dill Salmon Recipe - Ready in less than 30 minutes! Perfect for a light weeknight meal or easy entertaining! 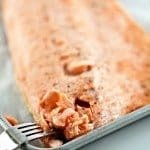 Place salmon filets on rimmed baking sheet lined with aluminum foil (for easier cleanup). Top salmon with lemon slices and sprinkle with dill and parsley. Drizzle with olive oil and sprinkle on salt and pepper. Place in oven and bake until internal temperature reaches 130º F, about 15 minutes. Remove from oven and cover with aluminum foil. Serve when internal temperature reaches 140º F.
Randy is such a salmon fan. He’ll be drooling over this one! I’m a huge salmon fan! Doesn’t get more classic than this! Salmon and dill just seem to go together. I love this, Robyn! Mmmm, I love making salmon at home! Definitely going to try this recipe soonest. 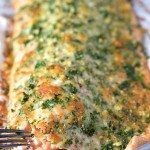 I absolutely love a simple salmon recipe. This looks great. Wow this looks fantastic. I love simple delicious recipes. 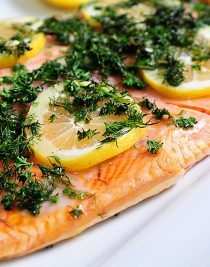 Your salmon looks WONDERFUL I just love lemon and dill and wil have to make salmon this way next time. I used to make a lemon dill creamy sauce, but really this looks even better! Hubby doesn’t like lemon but loves lime-would lime slices work well? I think they would work just fine. Let me know what he thinks! I love dill with salmon – looks delicious. I like to add a side of cucumbers in Greek yogurt with dill to my salmon. Thanks so much, Elizabeth! I hope you have a great day!